The LHC and other particle physics experiments continue to confirm the Standard Model in an impressive manner. To date, no conclusive sign for New Physics in the TeV range has been found. In the absence of straightforward, direct signals for New Physics, precision measurements will allow us to continue the search for physics beyond the Standard Model. Precision measurements sensitive to New Physics can be carried out at the LHC, and in particular at its high-luminosity extension. To fully exploit this experimental program, adequate theoretical predictions are crucial. These should be available within the Standard Model, but also in extensions thereof. The rapid progress in techniques for the evaluation of perturbative corrections at least at next-to-leading order and the accompanying automation open the possibility to routinely calculate higher-order corrections in extended models. 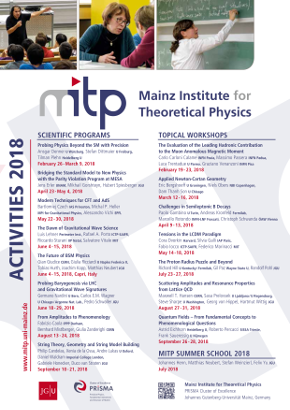 The goal of the scientific program is to bring together leading experts in the field of higher-order calculations with experts in the phenomenology of theories Beyond the Standard Model (BSM) and effective field theories at the LHC. The aim is to improve the communication between the different communities and to foster the preparation of appropriate automated tools for precise predictions in relevant extended models.